The Robens Light Dreamer is repeated again this season after a sparkling debut. It still retains the tunnel tent credentials of the larger family sized Dreamers but this is a genuine 3-person tunnel which has been manufactured to the highest quality and will perform perfectly in poor weather conditions. 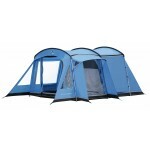 The layout features a 3-berth inner, a side 'J' door and a large front porch area which is ideal for gear storage or for cooking in poor weather. 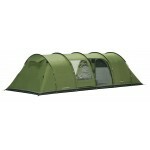 Other features include a mud valance for keeping out the worst of the elements (no way to describe mud wrestling fans! ), a PVC window, a hanging point system and a mosquito net. 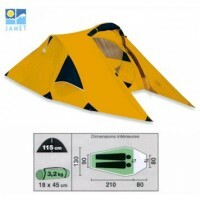 The flysheet is HydroTex 5000, fire retardant polyester fabric with silicone/PU coating providing a hydrostatic head of more than 5000mm, the inner is breathable ripstop polyester and the groundsheet is 210T PU coated Nylon. The weight is kept smartly in check by utilizing Alloy-combination poles (12.8 and 11mm dia.) for the frame construction. 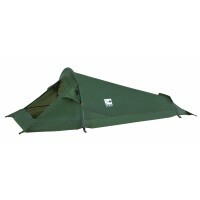 Living area groundsheet not included. 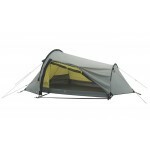 Robens Light Dreamer Tunnel Tent - 2010 Model.